From the moment the wreck was found, the Titanic had endured 20 years of intrusive visits, whether for research, salvage, or just plain greed and publicity; trips occurred in 1985, 1986, 1987, 1991, 1993, 1994, 1995, 1996, 1998, 2000, 2001, 2002 (including an illegal plundering of artefacts), 2003, 2004 and finally 2005. Then, they stopped. When the Keldysh and its two Mir submersibles left the wreck co-ordinates in 2005, those on board were the last to view the ship for five years. There was talk of commercial trips to the wreck in 2006 and 2007 (for instance, to look for David Concannon's "Ribbons of Steel") but these never came to fruition as the Russian government seconded the Mirs to Lake Baikal and to help in oil pipe inspection tasks. In 2010, the hiatus finished. The salvors of artefacts from the wreck, RMS Titanic, Inc., announced a trip to the Titanic's hulk not for salvage, but to chronicle the rusted remains, and to have these findings made available to the world. Oh, and to help in a 2012 History Channel documentary too. It seemed intriguing. Visits to the wreck had been so frequent it was hard to deduce what damage and degredation had been caused by human visitors or natural corrosion. With no visitors to the wreck in five years, we had a chance to identify what Mother Nature had done to the wreck, and what human intervention had inflicted. Dr. Ballard, in his National Geographic tirade in 2004, placed the blame for the ship's deterioration on human curiosity. His article included a diagram, included here, which showed a sad prediction for the Titanic's condition in forthcoming years. 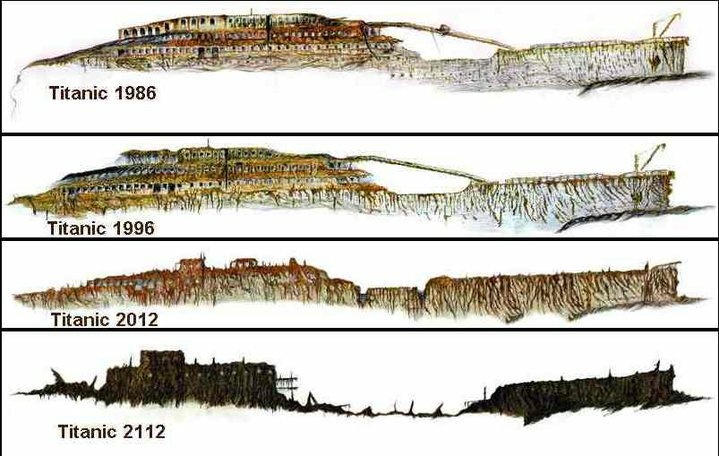 Fortunately, although we are still a year away from comparing the wreck with the 2012 artist's diagram, we are confident that the prediction is alarmist. Others seemed to agree with Ballard; Jack Eaton and Charles Haas alledge that the marks of manipulator arms could be seen on some areas of the wreck, for instance, the captain's bathroom, to prise the walls apart for better imaging. But their words should be treated with caution: in the second edition of "Titanic: Triumph and Tragedy" they present two photographs of the buckled starboard bow under the well deck, one from 1987 and the other from 1993; they write that "[the second photograph] shows corrosion has softened the contours of the shell plating's exposed edge, suggesting that disintegration of the ship's hull is accelerating." This is actually slightly dishonest; the photographs are shot from slightly different locations, and the second one (1993) seems to be out of focus. Then there is the issue of colour: the first picture has a ghostly blue tint, like most of the 1987 photos this author has seen, whereas the one 6 years later shows the rust colouring of the hull very well. But others disagreed with this. Ballard's ghost-written tome of 1987 mentions that bacteria are responsible for the long iron tendrils called "rusticles" and later analysis by Dr.Roy Cullimore and Dr.Lori Johnson have added to our knowledge of which bacteria are causing the deterioration. Indeed, Johnson even told UK TV presenter Tony Robinson that 200 lbs of iron were being "eaten" each day. In 5 years, this amounts to 365,000 lbs (166 tonnes) ... and in 98 years this equals 7.2 million lbs (3300 metric tonnes); a lot, but far short of the actual mass of the Titanic herself. These two microbiologists have written a paper; it mentions "at least [a] 30%" increase in rusticle formation between 1996 and 1998, and that the upper promenade deck (boat deck?) is deteriorating "from the aft" moving forwards at a rate of approximately 30cm a year. They expect that the deck structure of wreck to have gone by 2028, but concede that "other elements of the ship will stay intact for hundreds of years." But there was one dissenter; Dr.Tim Foecke; in his co-authored book "What Really Sank The Titanic?" he dismisses the rusticle argument on the grounds that the mechanism for the digestion of iron had never been described. However, in 2010, it was announced that a brand new bacteria had been cultivated from samples gathered during the 1991 IMAX voyage: Halomonas titanicae. 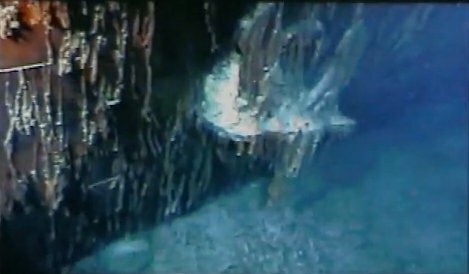 Some have claimed that the "increased" rusticle growth between, say, the 1987 and 1991 expedition are indications of an increase in the degredation of the hull. This author is sceptical. 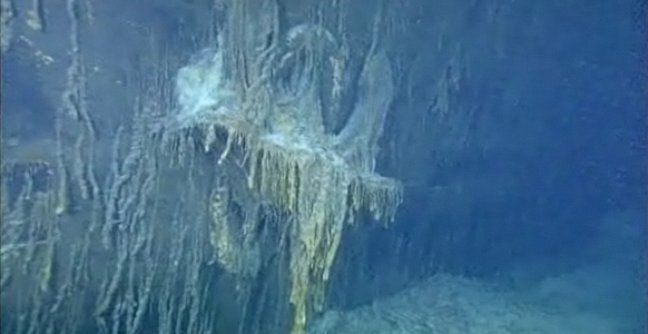 The rusticle structures are so flimsy that they disintegrate in the wash from a submerisble's propellor...not to mention the undersea currents which have been reported to be quite strong at times. Unless one can definitely associate a rusticle in one photograph with a rusticle taken years later, it seems silly to definitely state the amount of deterioration in the mean time. 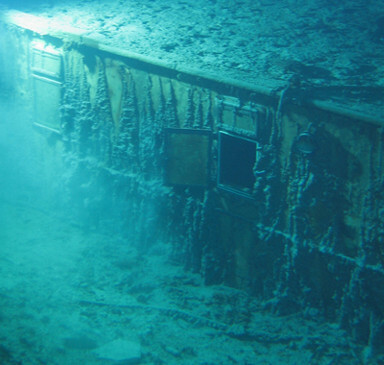 If anything, rusticles inside the hull, and protected from undersea currents would give a better indication of their growth, but we must be careful on this issue as silt and mud can be carried far inside the ship by the currents and dislodge the fragile rusticles. 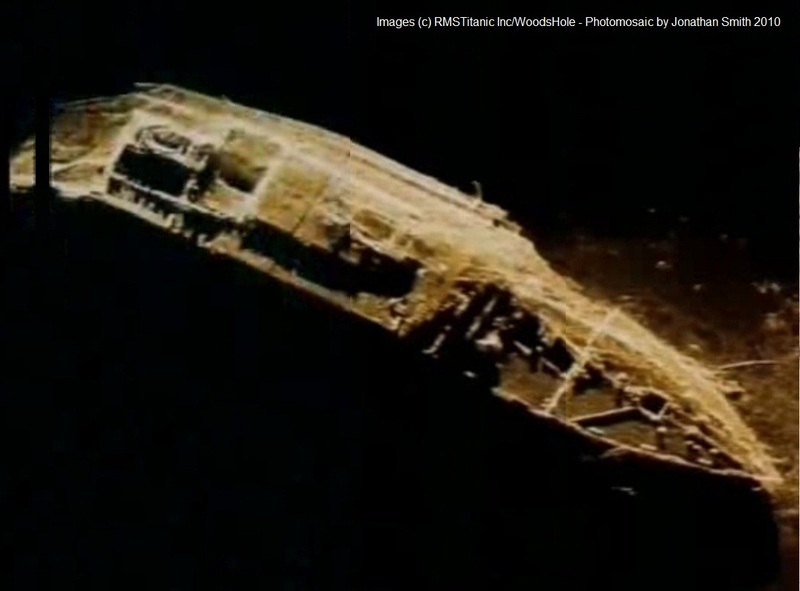 At any rate, the Research Vessel, the Jean Charcot was ready to take its assemblage of scientists, technicians, historians, TV personnel and so on to the wreck site in August 2010 to catalogue the Titanic in 3D images and sonar data. The mission was a collaboration between RMS Titanic, Inc., the Woods Hole Oceanographic Institution (who had participated in the initial discovery of the wreck in 1985), the Waitt Institute for Discovery, the Institute of Nautical Archaeology and the History Channel. One very early release of material was a sonar view of the bow section. It showed that the foremast, which had become fractured into an L-shape about 2004, was still in place. I had thought that it had long ago snapped and fallen either off the ship or into one of the nearby cavernous cargo holds. I was pleased to have been proven wrong. Inspection of the remainder of the image showed no massive signs of collapse in 5 years. The bow, mosaiced from sonar data by Jonathan Smith. But then, as I have reported in an earlier blog, the aims of the expedition became unravelled thanks to the efforts of Hurricane Danielle and Earl, and then Igor. The Jean Charcot scurried back to port and sat impotently there for days and days before a safe window of opportunity emerged and the vessel made its way back to the wreck. Obviously keeping the prime of material back for itself and its 2012 documentary, I have felt as though Titanic enthusiasts have been treated like hungry dogs while a complacent master throws scraps to his ravenous, baying pets. Certainly, nothing like the amount of material anticipated has been released. Even when the Jean Charcot was in port, the images we obtained were scant. 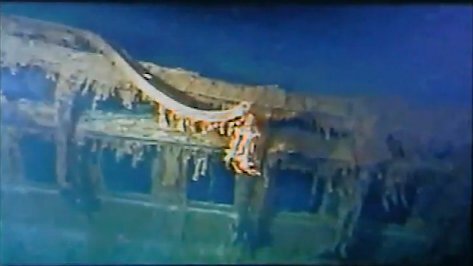 In 1986, images from the wreck were beamed back to shore and shown on television that very same day, and this was with technology comparatively primitive to the equipment available in 2010. To this end, I have collated as much material as I could glean from 2005 sources: "Last Mysteries of the Titanic", "Titanic: A Tale of Two Journeys", "Tony Robinson's Titanic Adventure" "Titanic: Missing Pieces," "Titanic's Achilles Heel," and the late David Bright's 2005 trip for his now defunct "Nautical Research Group." Certainly, the images here are given in good faith, to collate and to allow other researchers the chance to make some little judgements about the deterioration over 5 years; a task made immeasurably more difficult by the attitude of people who can't share the last few years of the sad ruin of the Titanic. Certainly, my attempts to engage RMS Titanic, Inc. both before and after the 2010 mission have been in vain: messages to the one email address that is provided (in mass mail-outs to hawk their wares) gets bounced back, their Facebook page provides no contact information, and even their company website is lacking in information to get in touch, either by email or by post. In the cronyistic days of Arnie Geller, even he would email back. Now there is a blank wall. One last point: the images presented here are not, as one researcher has said, "to make [Paul] appear 'in the know'": in the case of the afore mentioned researcher, being "in the know" means fraternising with, and being given preferential treatment from people like James Cameron, Dr.Ballard and NOAA, RMS Titanic, Inc., various Titanic luminaries and so on, as well as being given the opportunity to traverse down to the wreck itself, and then nonchalantly namedropping his associations. With such shameless boasting I am glad I am not part of this braggart's "in the know" clique of glitterati. Images presented below are in accordance with Fair Usage doctrines as adopted by relevant countries and companies. 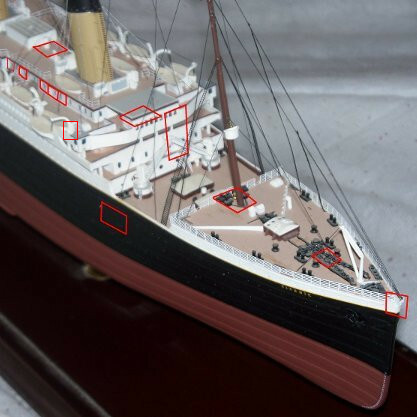 To see wreck photographs, please click on the red areas on the model. To view larger pop-up images of the wreck photographs, click on the thumbnails. There are only a few other areas that allow comparison are on the port side. If pre-2010 photographs are any indication, the port side has fared worse than the starboard side; there are large holes appearing in the areas between the tops of the windows and the roof of the deck houses. Maybe more images will emerge from 2010 that allow a comparison? Again, click on the thumbnails for bigger versions. Comparing the two images, there doesn't seem to be any indication of further gross disintegration or the spread of rust. 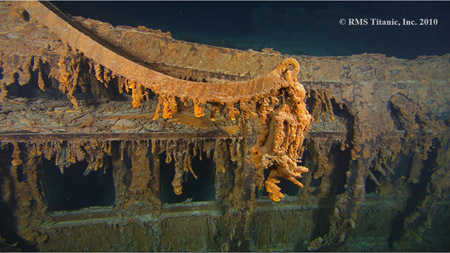 This part of the deck, close to the portion of the hull that angles down towards the break, has collapsed since the wreck was found in 1985; the boat deck now rests on B deck. There doesn't appear to be any extra areas of disintegration, but then, the image quality of the 2005 picture is poor. If Roy Cullimore's prediction is correct, the boat deck should be disintegrated (collapsed?) a further 1.5 metres (5 feet) forward. The third image is of the area surrounding the forward davit for lifeboat No.2. Unfortunately there are no photographs that allow a direct visual comparison. But unlike the area forward of boat No.1's davit, the deck in the location of the bridge wing has not collapsed since the wreck was found, although admittely it is difficult to tell. The best photo from 2005 is murky and indistinct in the distance. The only thing that seems to be different is that the inboard wall of the stair's coaming down to "A" deck looks like it has collapsed further down the staircase. It is immensely difficult to form any definitive conclusions from the meagre images collected here. Certainly, the amount of decay has not been anything like expected by some Titanic enthusiasts, with only localised areas of collapse; certainly, no gross or widespread areas of disintegration are obvious in the precious few seconds provided between now and 2005. It would be interesting to see the condition of the port side of the ship, but we must await further data on this issue. As an addendum to the above: the release of photographs showing the starboard side of the bow section, published in the April 2012 issue of the National Geographic Magazine shows the wreck to be in a worse state than I had thought. The annotated image is below (click for a large version) showing where the deck houses and funnels used to be. The collapse of the Grand Staircase foyer seems to have been before 2005 as it can be seen in a delapidated state in the 2005 images captured by David Bright et al. In 1985, the boat deck finished at the end of the gymnasium, where it angled downwards to the area of the break. 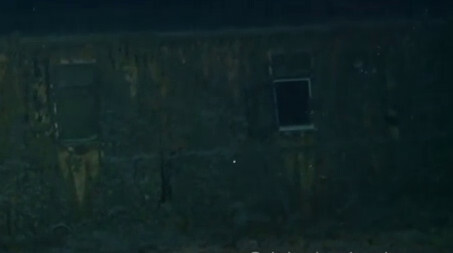 Now, everything aft of the 1st class cabins on the boat deck is collapsed on to the deck below. A hint of this can be seen in the 2005 images where the front starboard side of the grand staircase lobby is peeling away from the 1st class cabin area. Lack of imagery in this area from 2005 and 2010 hinders a full examination in this respect. "A" deck is now partially gone, and it is difficult to know how much had collapsed in 2005. Indeed, the gymnasium seemed to be collapsing into "A" deck in 2010; just outside, the base of the davit of boat station No.7 (now with the arm missing) still sits upright on the boat deck which seems to be in place; in other words, only the area of the gym is sinking. Strangely, the aft davit for lifeboat 8, which on the port side is level with the aft end of the grand staircase lobby, seems to still sit on the deck. "A" deck in this area is gone, and the windows below the davit are actually those of "B" deck. It was explained on a Facebook forum that aft of the expansion joint, although the inward side of the boat deck is still "attached" to the deck houses, further aft the deck slopes downwards and outwards. To visualise this, imagine a length of paper held up on four sides by struts. Now, remove the struts at one corner, and the paper will naturally droop towards the unsupported end. This is what we see with the davit; indeed, in some footage from 2005, you can see the slope as you proceed outwards from the area of the Grand Staircase foyer to the edge of the boat deck.